This training DVD is one part of a six part series aimed at manual handling in the health care industry. 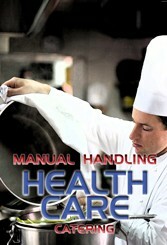 Manual handling is one of most common causes of injury in a hospital kitchen. Thinking ahead before moving any sort of load, and ensuring that the route is clear are both important to the reduction of risk with associated hazards. There can be a substantial amount of lifting, pushing and pulling required in the non clinical areas of a hospital but with a little forethought, improved technique and some planning, the required manual handling can be risk free. 8 minutes.